A call is now just a watch away, actually. 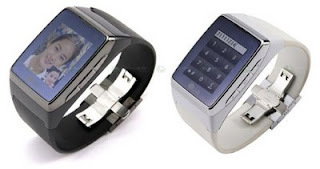 LG has unveiled a brand new 3G Watch Phone - LG GD910. The GD910 features touchscreen technology and is touted to have one of the slickest interfaces you may have seen in a watch phone (assuming you may have seen any other watch phone before). The phone has a camera at the top-right corner and built-in speaker allowing the user to make video calls over high-speed 3G network according to a statement by LG Electronic.